Red is an oak tree who is many rings old. Red is the neighborhood wishtree ? - people write their wishes on pieces of cloth and tie them to Red (TM)s branches. Along with her crow friend Bongo and other animals who seek refuge in Red (TM)s hollows this wishtree ? watches over the neighborhood. You might say Red has seen it all. Until a new family moves in. Not everyone is welcoming and Red (TM)s experiences as a wishtree are more important than ever. 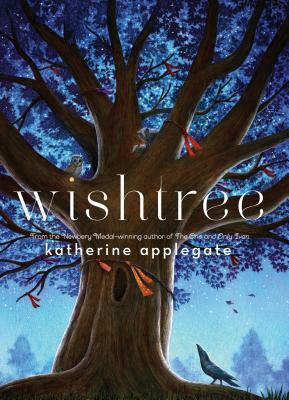 Funny deep warm and nuanced Wishtree is Katherine Applegate at her very best writing from the heart. Katherine Applegate is the author of The One and Only Ivan, winner of the Newbery Medal. Her novel Crenshaw, spent over twenty weeks on the New York Times children's bestseller list, and her first middle-grade stand-alone novel, Home of the Brave continues to be included on state reading lists, summer reading lists, and class reading lists. Katherine Applegate lives in Tiburon, California, with her family.